My first short story published! Coming out in October of this year, local speculative fiction publisher Third Person Press is releasing an anthology of ghost stories. 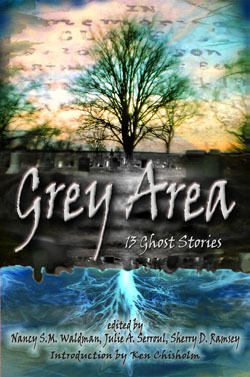 It’s called Grey Area, and it features stories by thirteen Cape Breton writers, including myself! I’m proud to say that this is my first short story published in an anthology. My story is called “Night Swimmer,” and it’s about a young woman who wakes up in a cemetery, in between life and death, who finds herself guided to the other side by a fellow spirit. She looks back to the life she was living before her death and gets to see her lover one more time before she must cross into the unknown. The press has launched a fun Indiegogo campaign to raise some money to help the book go a little further, and you can help support it (and get some fun perks like copies of the book and/or ebook, bookmarks, Grey Area-themed jewelry, cover art and other special ghostly artwork, a chance to interview one of the writers for your own blog, a detailed critique of your own writing, even dinner out with the editors of the press!) by clicking here. In the next few months here on my blog, I’ll be sharing an excerpt from my short story, as well as the journey from being just a kid who likes to write, to getting a short story published. Oh and, here is the Q+A with the editors of Third Person Press from last year on this blog, when they published the anthology Unearthed. 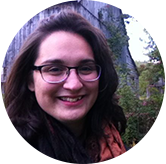 This entry was posted in Writing and tagged Cape Breton, ghost stories, Short stories, Third Person Press, writing. Bookmark the permalink. 8 Responses to My first short story published! Congratulations, Leah! I told you you are a wonderful writer! Congratulations Leah. You must be so proud. Looking forward to meeting you at the book launch and reading your story. I already know you can write. Can’t wait to read it.